There comes a time when just about anyone can use a torch to accomplish a task. The problem is it’s not always practical to get out, assemble and use a full size propane torch. That is why many people choose to own a smaller and more compact size butane torch. The best butane torch can easily handle many jobs that require some high heat for a few seconds or more. Many people are not even aware that such torches exist. They are great for doing some flaming deserts in the kitchen, soldering and many other small tasks. In this article we will take a closer look at five excellent model butane torches and do some in-depth reviews on them. We will also give you some other information on how best to use these devices and some helpful buying tips. We will review each of these model butane torches more thoroughly following the handy buying guide and information on how to best use them. Which Is Our Preferred Butane Torch Model? One of the biggest reasons people use butane torches is they are much smaller and much more compact than propane torches are. That means they are easier to control and great for precision heating. That is why they are the torch of choice for jewelers, bakers and some plumbing professionals. There is some variation in size among models though so you have to take this into consideration. There are some butane torch uses that you really want maximum control and you will need one of the smaller size butane torches on order to get that. So be aware of the exact dimensions of any model butane torch you are thinking about buying. Some of the cheaper butane torches only have a torch head mounted on a can of butane fuel. Although these work well in most cases they make it very hard to hold onto the can especially if there is oil or moisture on the can. They can even be dangerous if you have them on the automatic flame setting and you drop it. That is why the better butane torches come with their own bodies. Many of these torch bodies will have a rubber or textured grip to make the butane torch easier to hold onto. You really don’t want to use a butane torch that does not allow you to grip it well. There are generally only two ways that you can supply fuel to a butane torch head. We just mentioned that some torch heads are made to simply twist on to a can of butane fuel. These are the easiest method to supply fuel to a butane torch head. The other way is by filling a butane torch that has its own body with a can of butane fuel. This is not so easy and you have to take your time because if you spill it you are spilling a flammable liquid. It’s done the same way as you would fill a butane lighter. On the simplest styles of butane lighters you may have to light them with a match. 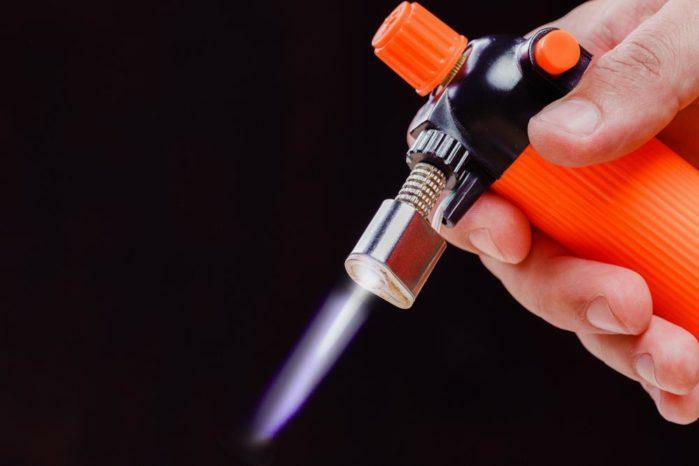 Most butane torches these days will have some type of electric ignition and that is by far the easiest and safest way to light any butane torch. When you are shopping try to learn how the ignition works on any model butane torch you are thinking about buying. 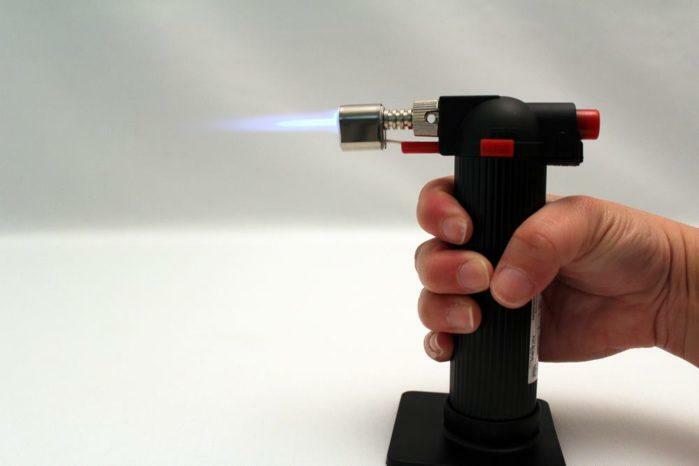 You really want to get a model butane torch that has an easy to use electronic ignition. You would like any model butane torch that you buy to have an adjustable flame. The reason for this is because as you adjust the flame you are also adjusting the heat. There is no one size fits all setting for every task you do when using a butane torch. For example; welding and jewelry repair need to use very high heat settings while caramelizing the top of your Crème Brulee desert only requires a very low heat. When you are shopping for a new butane torch make sure you buy one that has built in safety features. Although these tools don’t seem dangerous because of their size they can be if used in the wrong way. Look for a model butane torch that has such safety features as a flame guard, instant flame kill switch and a safety stand. There are some model butane torches that are built very flimsy. These are not model torches that you want to buy for sure. Chances are that at some point when you are working you will bang the tip of your butane torch or it will fall over. Get a model torch that is solid and built to last so it won’t break easily when these sometimes unavoidable incidents occur. 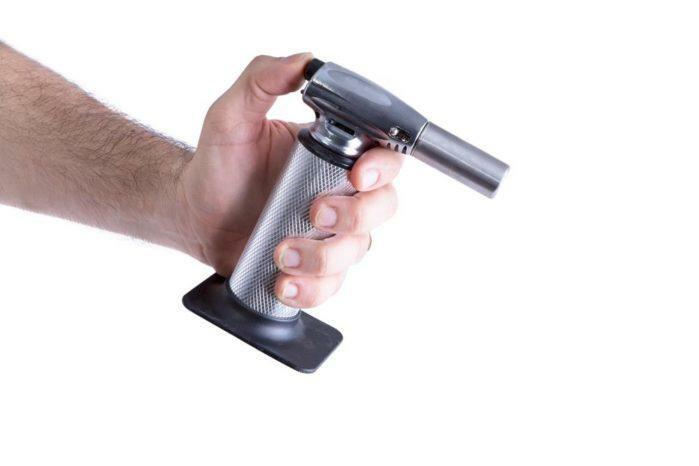 Ingeniosity taught this excellent butane torch as being a culinary kitchen aid but it can do a whole lot more than just that too. It is a very well-designed and very safe torch product to use too. If you do use this model it will make heating specialty deserts and searing meats very simple thanks to its over 2000 degree heat. The flame and air content are fully adjustable too. It will run up to 60 minutes once the butane has been refilled and most users say refilling this torch is very easy. We mentioned this is a very safe torch model to use. It has such safety features a flame guard so you don’t burn your fingers while holding it and a sturdy base that won’t allow it to tip over easily when placed on a counter top. Perhaps the best safety feature it has is the locking ignition switch that will prevent curious children from getting into trouble. The one year 100% money back guarantee will give you a lot of time to make sure that you like this product too. Blazer has designed a very nice all-purpose butane torch with this model. It can be used for everything from cooking to soldering. It has a sturdy design that includes many built-in safety features too. This butane torch lights up fast and easy thanks to its light touch ignition switch that uses piezoelectric controls. Once lit, you can use its 2500+ degree heat to do a variety of tasks that require quick heating. It has a very low blowout rate even when used outdoors and you can also adjust the flame size from 1 to 5 inches you the built in adjustment dial on it. This is a relatively safe butane torch to use too. It comes with such safety features as a detachable base to keep it from tipping over when placed on a flat surface. The brass flame nozzle is also designed to not flare up when you tilt the torch at an angle. This is another very good multi-use butane torch model. It lights easily and is simple to work with. It is perfect for everything from caramelizing the top of your crème Brulee to brazing broken jewelry pieces back together. At a mere 8 inches high and 13 ounces in weight this model butane torch is very easy to handle. It comes with a detachable base that will hold it upright when the torch is placed on a flat surface. One of the best things about this model butane torch is that its flame is very adjustable. That means you can fine tune the amount of heat you need for a specific task. It even has a convenient window on the side of it to show you how much butane you have left. The 90 day money back guarantee gives you plenty of time to test this product out to see if you like it or not. Just because this fine model butane torch is made by EurKitchen don’t think that it’s not an excellent multiuse tool. Not only can it do things such as perfectly sear meats it can also be used to make jewelry repairs and is perfect for light soldering tasks. It’s always ready to go do any job you have that requires quick intense heat. This is a very lightweight and compact butane torch model. It weighs only 8 ounces and is only 9 inches tall. It also features piezo ignition and many built in safety features such as its flame guard and safety stand. You can conveniently set the flame length on this torch model from anywhere between 1 1/2 – 6 inches. It lights quickly and easily thanks to its flame starting piezo switch too.Best of all you can get your money back no questions asked within a year of purchase. JB Chef has done a very nice job with the design of this butane torch model. Even though it was primarily made for kitchen use it can easily be used for many other tasks. It will work well for soldering, brazing, craftwork and more. In the kitchen you will be able to bring some serious heat in a hurry with this tool. It does such things as sear meat, caramelize Crème Brulee and browning meringues very well. It can produce a flame up to 6 inches in length if required. This is a sleek looking product that will not look out of place sitting on your kitchen counter either. It us the most stylish butane torch on our review list. It’s a very lightweight and compact model butane torch too. You can easily take it with you anywhere you go. Best of all it is backed up by a full lifetime warranty. This has to be five of the closest products that we have ever had to compare to pick a model we liked best. They all really are excellent butane torches. If we absolutely had to choose the one we like best it would have to be t﻿he EurKitchen Culinary Torch that can be used for Brazing, Welding and Soldering too. We like it so much because of its versatility. You can use it to repair jeweler or toast marshmallows to make your s’mores equally as well. Its flame is highly adjustable and the angle of the flame tube points slightly upward so the heat stays away from your hand. There is also a safety heat shield built into it to protect your fingers and a detachable base to keep it stable if placed for use on a tabletop. It is also the lightest model butane torch on our top review list. It even comes with a no questions asked 1-year money back guarantee. There is truly a lot to like about this compact and reliable butane torch model. You should consider purchasing if you are looking for the best butane torch model.